NEW YORK--(BUSINESS WIRE)--Jul. 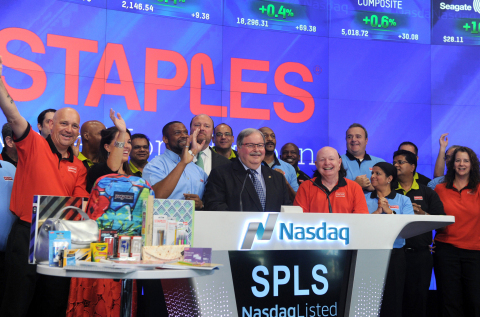 12, 2016-- Staples, Inc. (NASDAQ:SPLS) rings ‘First Bell’ at NASDAQ to kick off the back-to-school season including great deals, 110% lowest price guarantee and added convenience for stress-free shopping. 25% off School Supplies when you buy a backpack - Save instantly in store and online via coupon code. Valid July 3-August 13. Staples 110% Lowest Price Guarantee - Staples matches any competitors’ prices, plus gives customers an additional 10 percent of the difference between the Staples price and the competitor price at time of purchase. Less List for School - Season-long lowest prices on back-to-school essentials such as composition books, two-pocket folders, pens, scissors, crayons and technology like calculators, USB drives, ear buds, batteries and more. Weekly School Steals - Extra savings on popular items and can be found in the Staples weekly ad. Technology Deal - Receive FREE 30 days of tech support with any laptop, desktop or all-in-one PC purchase at Staples. Staples Rewards or Teacher Rewards - Members earn up to five percent back in Rewards and receive free shipping on orders over $14.99 on Staples.com. Teacher Rewards members receive up to ten percent back in Rewards on teaching and art supplies. No matter how customers want to do their back-to-school shopping, Staples offers convenient ways to shop in more than 1,300 stores, online at Staples.com or through their mobile app. Staples has expanded the back-to-school selection on www.staples.com/backtoschool by hundreds of retail-only items to make back-to-school shopping easier than ever to buy online and pick-up in store. New this year on the Staples back-to-school center are the Backpack and Writing Solutions Finders. Both tools are designed to help customers narrow down the selection of writing tools and backpacks to find the perfect fit. Customers are able to sort by brand, color, type and size to see a customized view of products specific to their needs. Adding even more convenience to the shopping experience, Staples teamed up with TeacherLists.com to offer individual classroom teacher supply lists on www.staples.com/teacherlists. Starting late July, Staples customers will have instant access to hundreds of thousands of back-to-school teacher supply lists even before the schools have had the chance to distribute. New lists are added every day. Staples is once again joining forces with superstar Katy Perry to help teachers bring learning to life for students during the back-to-school season. Continuing its long-standing commitment to supporting education through the Staples for Students program, Staples is donating $1 million to DonorsChoose.org, a charity that has funded classroom projects for teachers and has positively affected more than 18 million students across the country. Fans can enter the ‘Staples for Students’ Sweepstakes for a chance to win a $50,000 scholarship. The grand prize winner – in addition to four lucky first prize winners and one guest each – will also win travel to Los Angeles, where they’ll attend an exclusive Winners VIP Celebration with Katy Perry. Visit www.staples.com/StaplesForStudents to learn about entry into the sweepstakes and for the rules. Entries must be submitted before September 10, 2016 at 11:59 PM ET and entrants must be 13 years or older.